@iyanpol12's - song of the day battle symphony by linkin park! @phantum's - 60 days work-out challenge day 1! @jemmanuel's - libuacan cold spring tagbina surigao del sur or a travel guide! @kahawenz's - teardrops illustration golden tears! @dcrealyn's -colourfulphotography photo contest, there are dark shadows on the earth but it's lights are stronger in the contrast! @yennarido's - paglalakbay sa dako paroon araw ng miyerkules pagaaral ang importante SD lahat! @loraine's - upfundme please help me build a yarn shop end of 30 days posting! @natz04's - ulogs post day 007 illustration of my paper jetski! @junebride's - buwakan ni Alejandra flowers! @skyphotographer's - being a father gives me the strength and positivity in life! @cassyjanine's - my macro photography of the day! @catietan's - friday streetphotography photocontests by juliank photocontests! @fherdz's - creation is filled with stunning variety! @pmerryllimsic's -a selfie as a token of being grateful! @aaronkp's - ulog 11 ice cream for everyone! @smyle's - break away from what stands between you and your happiness! @smyle's - why do some people live a double standard life! @dwightjaden's - my foodphotography superfood sea grape or sea carvian called aroroset in my country! @serenity08's - fudgy chocolate crinkle cookies! @dcrealyn's - vehiclephotography photo contest parade of the pot pot transportation! @jonabeth's - the one that caught my day wednesday col! @shezzag32's - just wanna say hello! @cjsean's - lemon buttered garlic brocolli with tofu! @cassyjanine's - let me end my day with my butterfly drawing! @ckadie1324's - ulog day 20 July 3 happy birthday to me myself and i ckadie1324 ! @catietan's - thursday colourfulphotography photocontests by juliank photocontests! @shirleynpenalosa's - this is my entry for today's photocontests under macro photography category by juliank! @lorner's - while I'm resting my son do capture in my cellphone! @benotbuday's - my entry for the sunsetphotocontest by flamingirl day 2 ! @mrnightmare89's - fisherman in a boat mypictureday submission! @jejes'- i killed an innocent chicken! @greatwarrior79's my ulog 27 a blessed day! @greatwarrior79's - how to prepare white chocolate mousse on chocolate cups! @blessedsteemer's - word poetry challenge 9 maskara my entry! @mers' - our crazy humid weather and my hair drama! @maquemali's - the petals contest yellowflowerday! @maquemali's - food blog 2 typical pinoy's breakfast! @dizzyapple's - ulog 7 celebrating nutrition month! @purpledaisy57's -10th discord show with surpassinggoogle, purpledaisy57 even gecko loves steemgigs! @princessliz's - tpot contest no 24 strawberry picking at city of pines! @hania21's - b and w photo contest barasoain church malolos bulacan philippines! @pororo21's - Saint augustine parish church! @edith4angelseu's - it's a wild world! @euronation's - struggling with insomnia, no need to worry! @johnrel's - birth of a new angel! @reyarobo's - mayana with orange flower in colorchallenge photography tuesday orange! @rafaelpadilla's when casper when plasma ethereum third anniversary meetup! @sgbonus' - bgc taguig manila! @allyson19's - minimalist drawing contest eleven lines! @jhoevhee's - weird wednesday weird angle! @pmerryllimsic's - food photography surahan unicorn fish by pmerryllimsic ! @superjongky's - dailyfoodphotography, siomai is love! @cassyjanine's - paintings of celebrities or well known people! @img-financial's - do you want to travel to korea! @nasrul71's - opening uloggers contest weekly singing with my friends to celebrate surpassinggoogle in ulog week 01 ! 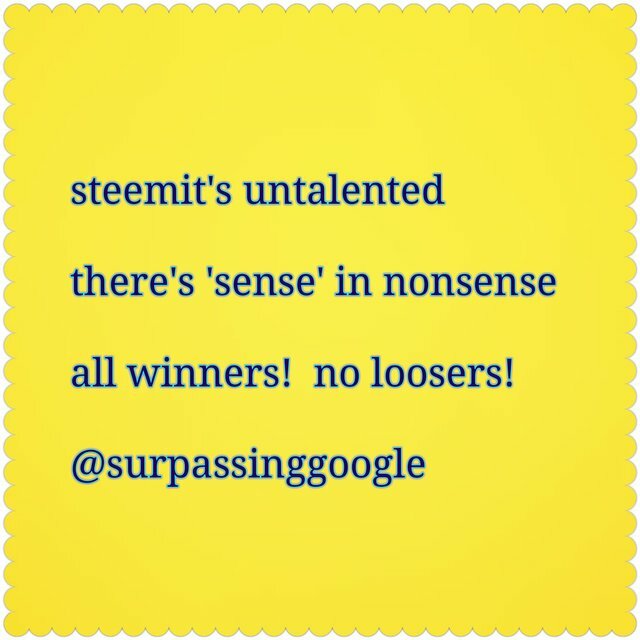 https://steemit.com/steemit/@surpassinggoogle/steemit-s-untalented-is-in-beta-participate-freely-because-every-participant-in-this-contest-will-win-something-no-losers Just incase you find any level or form of gifts, talents, attempts at out-of-the-boxness, or any steemian confidence about their abilities, worth, etc; please do not let it slip emptily by.Kindly call on me! Simply reply to any such post and add @ steem-untalented or #untalented to your reply and i will be there to upvote, acknowledge, strengthen and encourage them. Thank you @steem-untalented and @surpassinggoogle for another featured/curated tonight! Our master @iyanpol12, madam @phantum04, @junebride, @cassyjane, sir @dwightjaden, @jejes, @blessedsteemer, mam @purpledaisy57, and of course sir @nasrul71 congratulations fellow steemians who got featured! You deserve it! I hope to be featured one day too. These posts were really worth it. Thanks @surpassinggoogle for always being a support. Thanks so much to @steem-untalented @surpassinggoogle for the unending support. Congratulations to our master @iyanpol12, madam @phantum04, lodi @junebride, sir @dwightjaden, and mam @purpledaisy57, for being featured! Well-deserved! The untalented us becomes talented through this. Thank you so much for the effort. Congratulations to all featured! Amen to that sir Terry! post is so long make it short next time. steemit is better platform than any other social media. can you give me a suggestion how to grow on steemit platform and how to increase earning and steemit power??? Kuddos to sir Terry for the effort in curating many steemians. Congrats to all being curated ! Thank you @surpassinggoogle and @steem-untalented for the feature. Congrars to everyone @loraine @iyanpol12 @glenyosores and esp those who had 2 or more topics featured here.